Another unexpected turn in this race to the Whitehouse this election year is the flocking of people going toward Obama during the campaign. 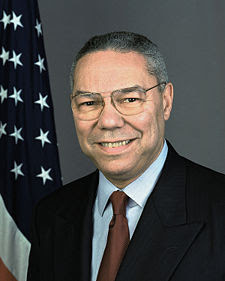 A very notable and influential person to support Barack Obama happens to be the former Secretary of State Colin Powell. See video clip below. His main reasons for supporting Obama is the ability for the Democratic candidate to inspire people, evidence supported by the high number of people signing up to vote this year. His campaign also is very well organized and he continues to bring in lots of money f rom people supporting his campaign. He is outspending John McCain almost 5 to 1 in election ads on both TV and radio. Barack Obama is fighting hard to the finish, in an attempt to make his now 15 month trek to the Whitehouse successful. Colin Powell states "I think he is a transformational figure, he is a new generation coming onto the world stage, onto the American stage, and for that reason I'll be voting for Sen. Barack Obama," Powell said on NBC's "Meet the Press". Other factors include the negative turn of Sen. John McCain and the campaign. People appear not to be looking for that kind of thing from the candidates, but are very interested in knowing how the candidate plans to fix the economy and other issues including taxes and the war. Instead Colin Powell states that John McCain has been wasting his time trying to run a negative campaign. It is one thing that you must fight to survive, which is what McCain is doing, but every time that he continues is negative approach to Obama, his campaign seems to suffer. Colin Powell seems to believe that Obama is steady with strong intellect and knowledge needed to handle the economy in these tough times, more than John McCain. He feels that Obama meets the tough standards of a good President. hello honeyko! congratulations of your new blog. Keep on writing...ill be here to support you forever. love you muah..